The master index collects all the Cyber Attacks Timeline blog posts for 2012 on a single table, which contains a brief description, an infographic of the timeline and the link to the original article containing references and Hyperlinks. Follow @paulsparrows on Twitter to get the latest updates on a regular basis. Also feel free to submit links to events that, according to your opinion, deserve to be listed on the timelines. December 2012 Cyber Attacks Timeline (Part II): List of Main Cyber Attacks from 16 to 31 December 2012. November 2012 Cyber Attacks Timeline (Part II): List of Main Cyber Attacks from 16 to 30 November 2012. October 2012 Cyber Attacks Timeline (Part II): List of Main Cyber Attacks from 16 to 31 October 2012. September 2012 Cyber Attacks Timeline (Part II): List of Main Cyber Attacks from 16 to 30 September 2012. August 2012 Cyber Attacks Timeline (Part II): List of Main Cyber Attacks from 16 to 31 August 2012. July 2012 Cyber Attacks Timeline (Part II): List of Main Cyber Attacks from 16 to 31 July 2012. June 2012 Cyber Attacks Timeline (Part II): List of Main Cyber Attacks from 16 to 30 June 2012. May 2012 Cyber Attacks Timeline (Part II): List of Main Cyber Attacks from 16 to 31 May 2012. April 2012 Cyber Attacks Timeline (Part II): List of Main Cyber Attacks from 16 to 30 April 2012. March 2012 Cyber Attacks Timeline (Part II): List of Main Cyber Attacks from 16 to 31 March 2012. February 2012 Cyber Attacks Timeline (Part II): List of Main Cyber Attacks from 16 to 31 February 2012. 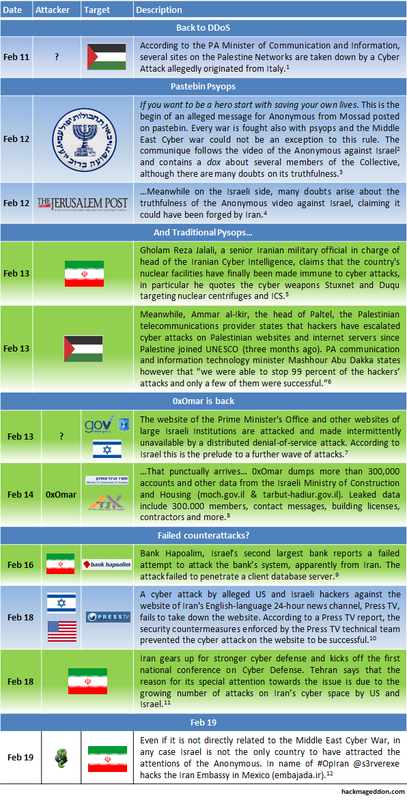 Middle East Cyber War Timeline (Part VI): An infographic of the Cyber war in Middle East Between Israel and Saudi Hackers (from Feb 19 to Feb 28). 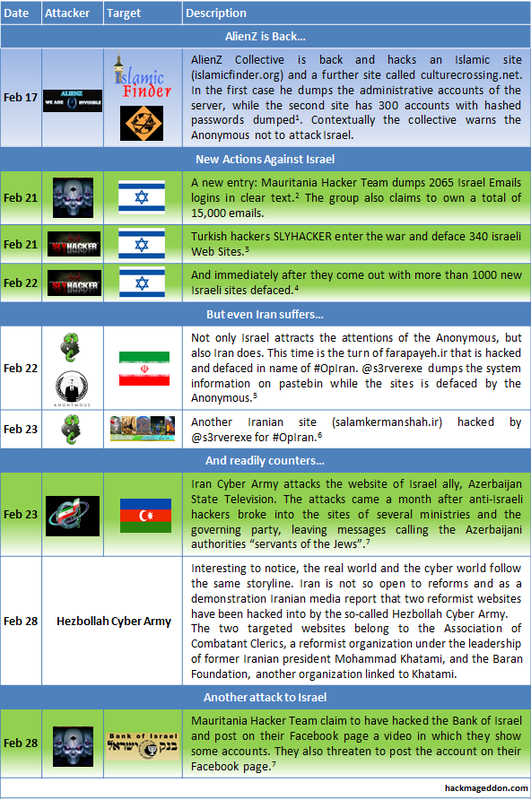 Middle East Cyber War Timeline (Part V): An infographic of the Cyber war in Middle East Between Israel and Saudi Hackers (from Feb 11 to Feb 19). February 2012 Cyber Attacks Timeline (Part 1): List of Main Cyber Attacks from 1 to 15 February 2012. Middle East Cyber War Timeline (Part IV): An infographic of the Cyber war in Middle East Between Israel and Saudi Hackers (from Feb 5 to Feb 10). Middle East Cyber War Timeline (Part III): An infographic of the Cyber war in Middle East Between Israel and Saudi Hackers (from Jan 30 to Feb 4). January 2012 Cyber Attacks Timeline (Part 2): List of Main Cyber Attacks from 16 to 31 January 2012. 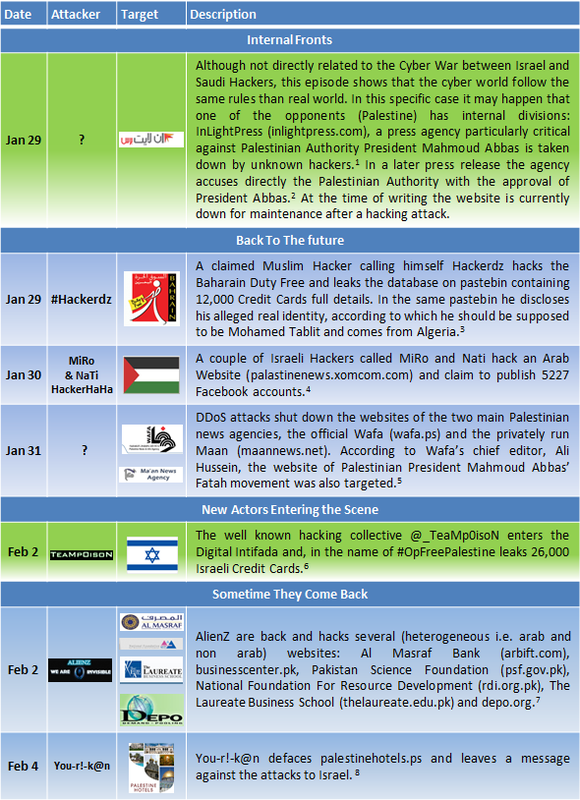 Middle East Cyber War Timeline (Part II): An infographic of the Cyber war in Middle East Between Israel and Saudi Hackers (from Jan 22 to Jan 29). Special Issue: Middle East Cyber War Timeline. 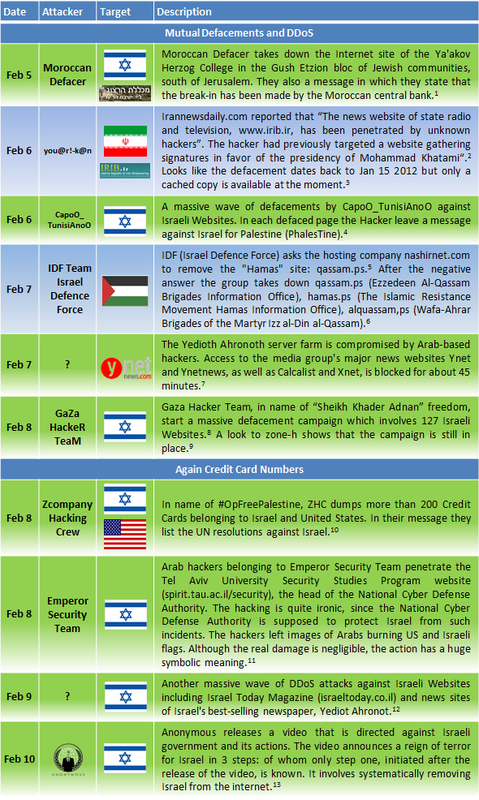 An infographic of the Cyber war in Middle East Between Israel and Saudi Hackers (updated to Jan 22). January 2012 Cyber Attacks Timeline (Part 1): List of Main Cyber Attacks from 1 to 15 January 2012. Hello, paolo!I am currently writing a paper on cyber attack and this is a really useful material. Can you be so kind as to send me the word format at [email protected] ? Thank you so much! Awesome work Paolo. Can I email you my address so you can email me the Word file too? Pingback:NEWS24H.pl - Top 5 największych cyberataków w 2012 roku! Hello Paolo! Can you please share those also to me? I’d love to know the exact numbers per month to have a yearly overview (love your pie charts and would like to see / create one for the current year up to now) Thank you! Sure, please send me an email to [email protected] indicating where I can send them to you. Paolo, is there some way to get the summary of each month in PPT? I mean the highlights monthly for this 2012. Hi Jose, I have the files in word format. Send me an email at [email protected] with the address where you want the files to be delivered. Your links for august part one and two are broken. Furthermore my company web filtering states: “Compliance Alert:URL – http://hackmageddon.com/2012/09/05/16-31-august-2012-cyber-attacks-timeline/; Category – Malicious Sites”. Any comment? I corrected part I (it pointed to a wrong location). I do not find the error for part II. Other people suggested me what you pointed out. Maybe a FP in your company web filter (Virustotal has a good reputation: https://www.virustotal.com/url/7608ad063d6987dd329e44e0972a979f08d9112adc1d9905a3588f42a0d6f39e/analysis/1348671964/). Do you know which is the web filter technology used by your company? Thanks. Pingback:Why some see unsettling parallels between this crisis and 1914? And guess who could be the next Franz Ferdinand?